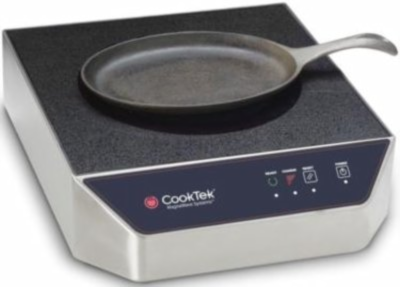 Almost all Cooktek lines come at three power levels: 1.8 kW (120-volt service), 2.5 kW, and 3.5 kW (all 240-volt service); some lines also have 1.5-kW, 120-volt units. 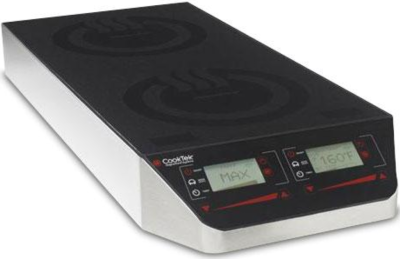 All Cooktek units within a given line will be the same size and shape; they will differ only in cooking power, current draw, and price. 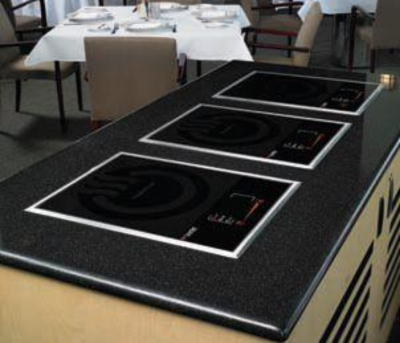 Cooktek has two broad classes of line: build-in and freestanding countertop. Within each type they have single-element units and woks. But, just to complicate the picture, each line also has a pair of dual-element units; moreover, some of the pairings include both side-by-side and front-to-back configurations. 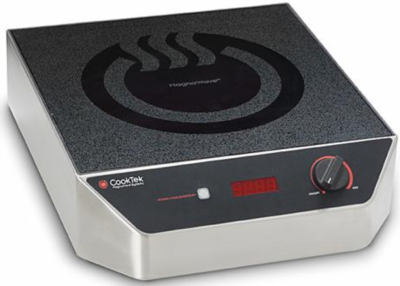 The basic ("Heritage") Cooktek line also has an upscale "mirror" line, the "Apogee" series, which is basically the same units with a fancier control-and-display front panel; the Apogee line also includes some "hold-only" buffet warmers (including a type that can be mounted invisibly below the surface of a stone or stone-like countertop). Besides those two lines, there is a line of really heavy-duty "back of the house" equipment. All that said, here's the roll call of the Heritage and Apogee lines. Within each line, the highest division is between build-in units and countertop units; within those types, we divided by standard types (which have the usual flat cooking surface) and wok types (which have special wok-bowl holders); within the standard types, we sub-divided the non-woks units by single-element units versus dual-element units. 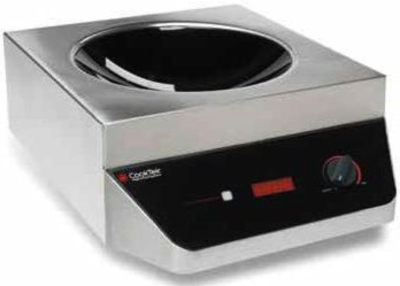 In addition, Cooktek produces some specialty lines not listed here—pizza-warmer systems, and heated-delivery systems. To keep from needlessly complicating the presentation, we show below details only for representative units from each of the product lines (Heritage, Apogee) and product series within those lines. 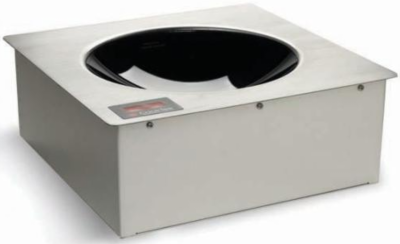 The others of each series differ from the unit shown only in power. 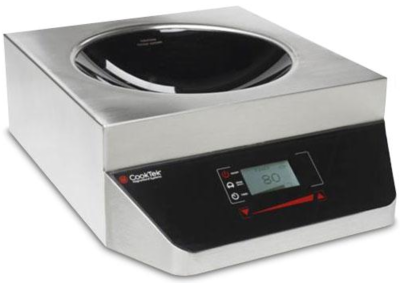 Excepting the MB-series Buffet Server stations, each product series has three powers: 1.8 kW, 2.5 kW, and 3.5 kW (the dual-element products each have two identical elements of equal power). Within each 4-power-level series, all units are for 240-volt service except the 1.8-kW units, which all run off standard 120-volt service, making them useful where dedicated appliance-voltage lines are not available. As the Table above shows, there are 11 product series. We present them here segregated by product line (Heritage, Apogee). As noted above, the newer Apogee line differs from the established Heritage line chiefly in its control/display features: the Heritage line uses knobs for control, while the Apogee line uses finger-touch "touchpad" sliders for control, and has somewhat sexier readouts. In actual heating performance, the lines ought to be essentially similar. 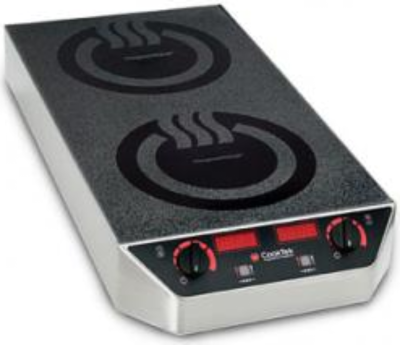 Note that all dual-element units can be had configured as either side-by-side (as shown below) or configured front-to-back for when lineal counter space is crucial. Again, use the Table above to understand (and to order from) the lines and series, and the listings below to see representative samples in detail. 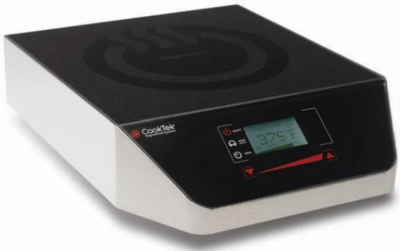 Clicking on any listing in the Table above will take you to a full-details page on that exact unit, from which page you can buy the unit if you like (there are no "buy" links below, because there we are only showing representative units, not the whole Cooktek line).